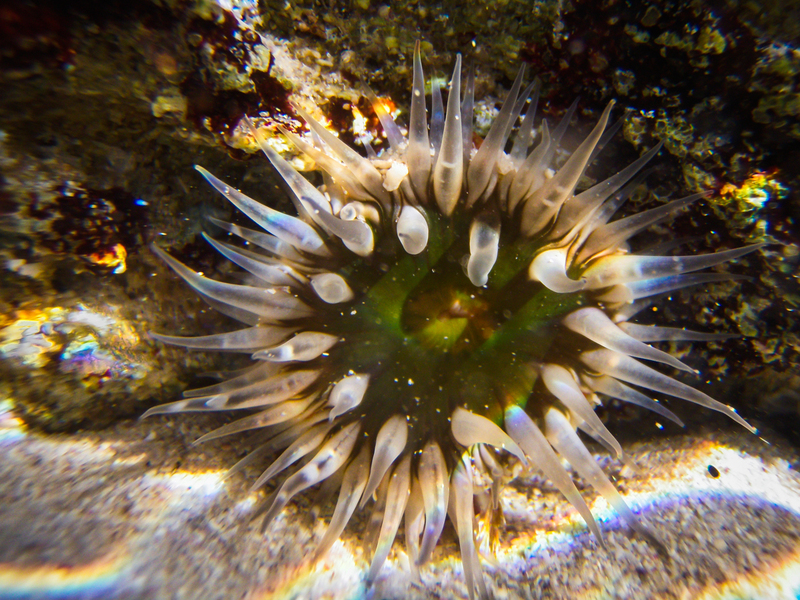 Photography – starting underwater photography. This is actually a little bit different to my other posts. More of tracking the beginning of my journey, whereas my previous ones have been from a little more well worn experience. 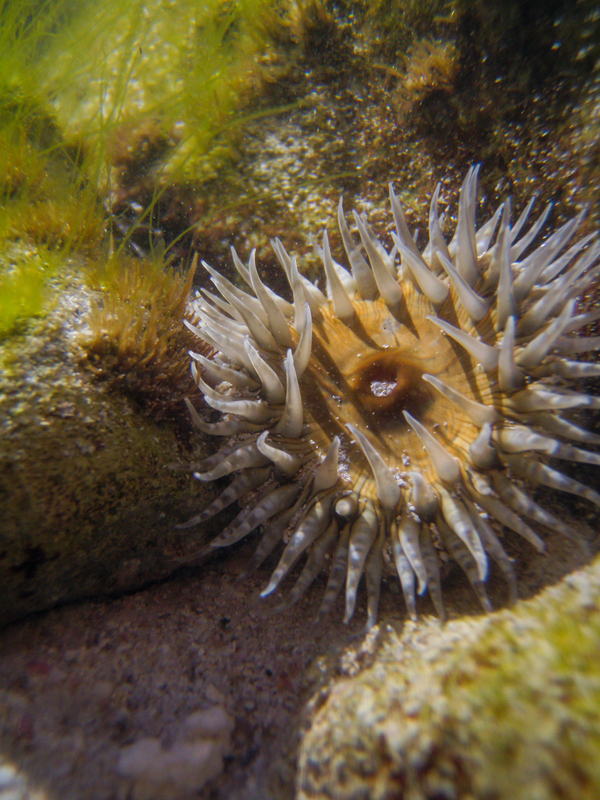 I have done some underwater photography a number of years ago – having purchased a cheap point and shoot Olympus 1050sw a earlier than I purchased my first DSLR. This camera accompanied us in our drive across Australia a year before I got into DSLR photography, but we didn’t really use it much then either. I note that the camera only shoots jpegs – so post processing is limited. Taking some shots at Burns Beach (Western Australia) using the early morning light. I wanted some direct light on the water to light the subjects (without resorting to flash). The reason why I went for early morning is that the water tended to be more calm. All these shots were shot in water that was less than knee deep. It was also cramped enough that I wouldn’t actually be able to snorkel into these rock pools. I had to time the shots between the waves for whenthe water was calm enough. I found the point and shoot had problems focusing at range. Also the particular camera I was using has a 1-2 second shutter delay >_<. Since I was out of the water, couldn’t see the preview screen of the camera so it was very much an estimate for the compositions. In order to get the images clear enough and avoid all the particulate matter causing scatter, the camera had to be as close as possible. So used the camera macro mode and it shot at a range of around 5-10cm. I found the macro of the point and shoot to be invaluable. Making me think about the minimum focusing distance of the Nikon AW1 being 30cm. Better for general swimming, but getting these close shots would be difficult – even with the zoom of the 11-27.5mm lens. I’ll try to compensate this with a close up filter to reduce the minimum focusing distance, but I’m not so sure about how badly the image quality will suffer underwater. 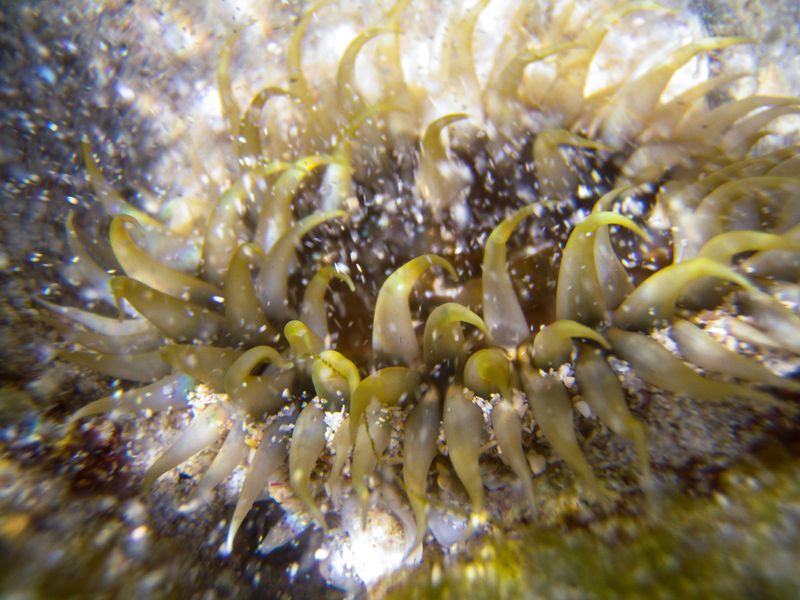 Makes me think that for a lot of these close up shots – a “cheaper” underwater camera may have substantial benefits over a camera that can shoot RAW for a starting kit – and much cheaper than going for an underwater housing solution for proper macro + RAW. All the normal photography concepts still apply – quality of light, compositional elements etc, just with the added challenges of the water medium and particles. I can imaging using a plastic board as a reflector to soften and reflect the light in shallow water. Another thing with underwater photography will be the usage of the flash. Direct flash can result in back scatter as the reflection of the flash off particulate matter in the water. Strobes are often used to deal with this, but are extremely expensive. The AW1 has a tiltable flash – an experiment I’m going to try is to see if I can power down the flash and use it as a flash trigger for another flash that I may put into a waterproof bag. Will use one of my “cheap” flashes when I try this. I did try some wave curl photos about a week ago as well – emphasis on try. The waves weren’t large enough and I was experimenting with camera settings. Looking forward to trying some snorkelling with the underwater camera and further experiments. Just have to wait for the right opportunity.